What are the chances of a white Christmas in Minnesota? As residents will tell you, it's pretty much a sure thing up north, (and less so in the Twin Cities), with a statistically far lower opportunity for snow as you head south. The overall forecast calls for COLD, but that doesn't stop residents from enjoying the warm glow of the holidays. the annual Bentlevyville Tour of Lights. 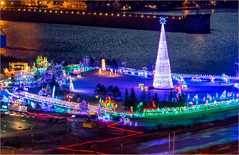 • Nathan Bentley's home holiday lights became so popular that the city of Duluth invited him to set up his "Bentleyville" display in Bayfront Festival Park in 2009. And the rest, as they say, is history. Today, the Bentleyville Tour of Lights is considered one of the top Christmas attractions in the Midwest. • The holidays AND model trains? Yes, please! Kids of all ages will want to head to the Twin City Model Railroad Museum in St. Paul for the annual Night Train exhibit where the lights are turned down low to show off lighted vintage model trains, toot-tooting around a make believe town covered in snow. • Take horse-drawn trolley ride back to the 19th century at Folkways of the Holidays at Minnesota River Heritage Park in Shakopee featuring the holiday traditions of Europeans who helped settle frontier Minnesota. Cultures represented include Norwegian, Swedish, Finnish, German, Jewish, French Canadian, and Irish. Christmas at Mall of America - The biggest mall in America is naturally big on holiday spectaculars. Check out the complete schedule as the holidays draw near. Holidazzle - Check out the daily Minneapolis Christmas parade and choir perform at Nicollet Mall happening throughout the holiday season. WinterSkate - Dust off your skates and head to downtown Saint Paul for this annual rite of winter with general information, opening hours and the full schedule. Christmas at the American Swedish Institute - Find out what's happening this Christmas featuring annual Minneapolis family fun - including choir performances, craft activities and traditional Swedish holiday treats. Duluth Christmas Events - Scroll down to see what's in store in Duluth and surroundings with links and information for Winterfest, the Snowflake Festival, Polar Express Train Ride, Nutcracker performances and lots more. Minnesota Choose-N-Cut Christmas Tree Farms - Here's a full list of top Christmas tree farms throughout the state with an interactive map, directions, and contact info.